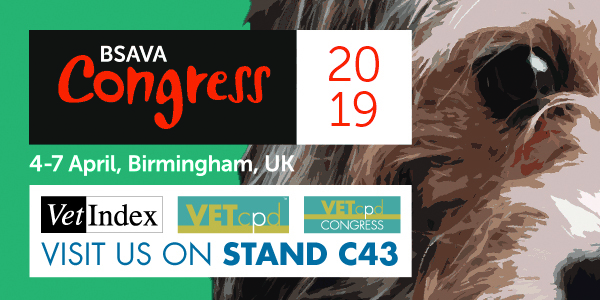 VetIndex and VetCPD are very excited to be exhibiting at the BSAVA Congress 2019 this April (4-7th) at Birmingham’s International Convention Centre. The BSAVA Congress is one of the Veterinary Industry’s main events and has over 450 hours of lectures and practical sessions on offer, combined with international speakers and experts, a dedicated small-animal exhibition showcasing the latest products and innovations, and countless networking opportunities and social events. VetIndex/VetCPD will be exhibiting at the event on stand C43. We’re very excited to announce we’ll be holding a special prize draw at the event. Simply visit our stand and hand in a completed entry form for our prize draw, and one lucky winner will receive a free one-day pass to our very own VetCPD Congress event this September 19-20th , that’s held at Bath’s prestigious ‘Assembly Rooms’ – a prize worth over £180! For your chance to win, simply complete the entry form* in your delegate voucher book and hand it in to us at Stand C43 during the BSAVA event. *only one entry per person. Winner will be notified via email after the BSAVA event.